Faster loading of the index page: We have enabled performance optimizations using gzip and HTTP2. AWS improvements: We have added metrics from CloudWatch RDS to 6 dashboards, as well as changed our AWS add instance workflow, and made some changes to credentials handling. 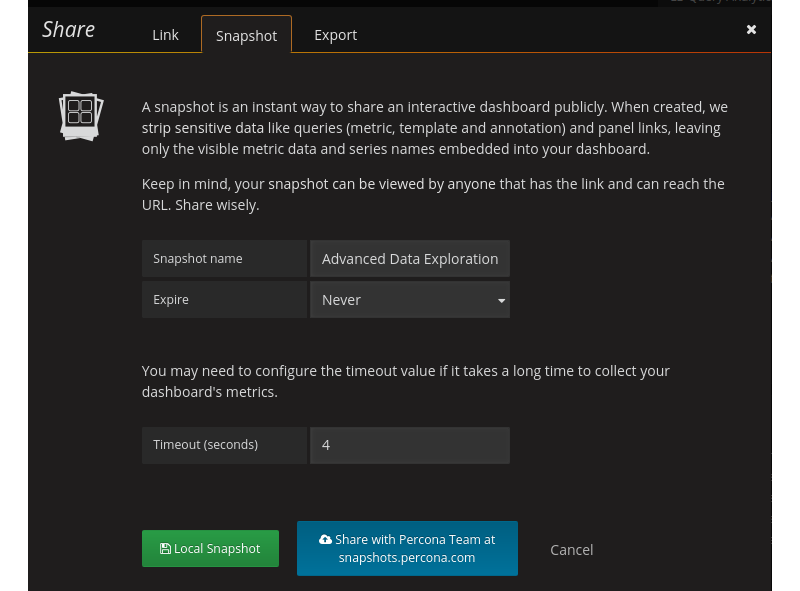 Percona Snapshot Server: If you are a Percona Customer you can now securely share your dashboards with Percona Engineers. Exporting PMM Server logs: Retrieve logs from PMM Server for troubleshooting using single button-click, avoiding the need to log in manually to the docker container. We have changed our AWS add instance interface and workflow to be more clear on information needed to add an Amazon Aurora MySQL or Amazon RDS MySQL instance. We have provided some clarity on how to locate your AWS credentials. We have improved our documentation to highlight connectivity best practices, and authentication options - IAM Role or IAM User Access Key. Snapshots are a way of sharing PMM dashboards via a link to individuals who do not normally have access to your PMM Server. If you are a Percona Customer you can now securely share your dashboards with Percona Engineers. We have replaced the button for sharing to the Grafana publicly hosted platform onto one administered by Percona. Your dashboard will be written to Percona snapshots and only Percona Engineers will be able to retrieve the data. We will be expiring old snapshots automatically at 90 days, but when sharing you will have the option to configure a shorter retention period. In this release, the logs from PMM Server can be exported using single button-click, avoiding the need to log in manually to the docker container. This simplifies the troubleshooting process of a PMM Server, and especially for Percona Customers, this feature will provide a more consistent data gathering task that you will perform on behalf of requests from Percona Engineers. In version 1.8.0, the index page was redesigned to reveal more useful information about the performance of your hosts as well an immediate access to essential components of PMM, however the index page had to load much data dynamically resulting in a noticeably longer load time. In this release we enabled gzip and HTTP2 to improve the load time of the index page. The following screenshots demonstrate the results of our tests on webpagetest.org where we reduce page load time by half. We will continue to look for opportunities to improve the performance of the index page and expect that when we upgrade to Prometheus 2 we will see another improvement. 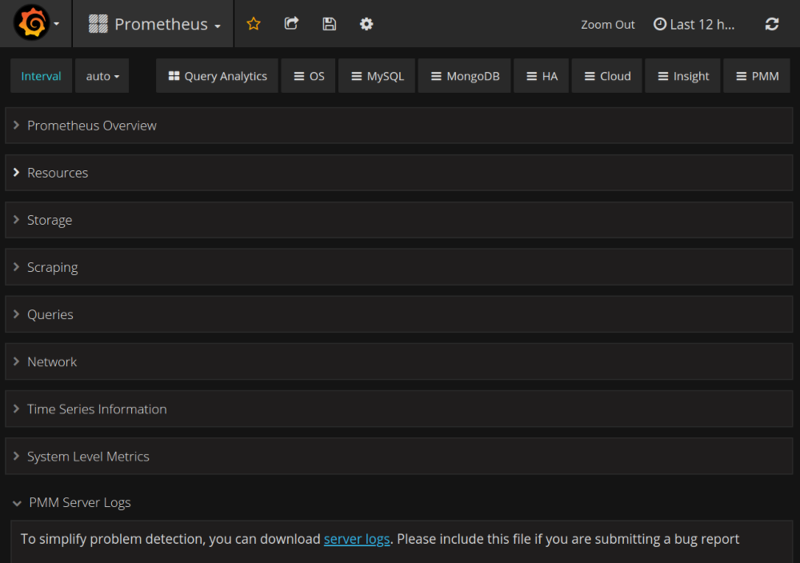 PMM-1587: Use mongodb_up variable for the MongoDB Overview dashboard to identify if a host is MongoDB. PMM-1486: MySQL passwords containing the dollar sign ($) were not processed properly. PMM-1905: In QAN, the Explain command could fail in some cases. PMM-2214: Setting Send real query examples for Query Analytic OFF still shows the real query in example.